Hong Kong film director Wong Kar Wai (Wáng Jia-wèi) first attracted attention in the West with the release of his third film, Chungking Express (Cantonese: Ch ung Hing Sam Lam, which means “Chungking Jungle”; Mandarin: Chongqing Senlin) in 1994. It was actually made during a pause in the postproduction work of Ashes of Time (Dung Che Xai Duk), an elaborate Chinese Wuxia (martial-arts) costume film that had been started much earlier and was being made along somewhat more mainstream lines. 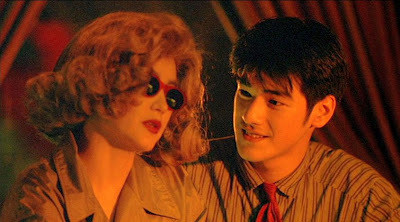 Chungking Express, by contrast, represented a continuation and further development of Wong Kar Wai’s now-celebrated personal style of filmmaking, which had been evolving through his first two features, As Tears Go By (Wong Gok Ka Moon, 1988) and Days of Being Wild (A Fei Zheng Chuan, 1990). With each successive step in this progression, Wong’s narratives appear to be more aimless, more unstructured. The focus is more and more strictly on the psychological mood of the characters. In Chungking Express, the narrative comprises two separate stories, told in sequence, about policemen working the beat in the vicinity of the Chungking Mansions, a famously seedy Hong Kong locale and gathering place for night people of all ethnicities. (Wong Kar Wai originally planned to have three stories, but wisely expanded the second and more compelling story of Chungking Express”, deferring presentation of the third story to his next film, Fallen Angels.) In some films, the backstory is minimal – we jump straight into the action withou t knowing much about the backgrounds of the principal characters. Here, it is just the opposite: the backstories of the two narratives are most significant foci of attention, and a considerable portion of each of the two stories is spent on melancholy reflections concerning the recent offscreen romantic breakups of the two cops. 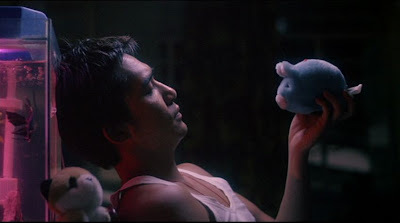 In the first story, Takeshi Kaneshiro, who would later appear in Wong’s Fallen Angels (Duo Luo Tian Shi, 1995) and Zhang Yimou’s House of Flying Daggers (Shi Mian Mai Fu, 2004), is plainclothes cop He Zhiwu and is also known as “Cop 223". He hangs around a late night fast food stand, “The Midnight Express”, from where he calls up his answering service hoping that his girlfriend, May, who has just dumped him, has left a message. To provide some sort of structure to his now empty existence, he sets himself arbitrary tasks, such as strenuous jogging and eating daily doses of canned pineapple (May’s favourite). What we see are the outer manifestations of the man’s inner emotional wasteland. He figures that if she doesn’t come back to him in one month, by the time of his birthday, then it’s all over, and he will have to give up. Meanwhile Cop 223's melancholic reflections are interspersed with a separate and parallel set of noirish underworld scenes tracing the activities of a mysterious woman in a blonde wig, sunglasses, and wearing a trenchcoat (played by Taiwanese film star Brigitte Lin), who is organizing a big-time drug smuggling operation with some local Indians. Eventually, Cop 223's self-imposed time limit on his girlfriend elapses, and he resolves to fall in love with the next woman that he runs into. This turns out to be the mysterious blonde-bewigged drug smuggler, who has just been double-crossed by her co-conspirators and is running away from a deadly shootout. As it happens, 223 had already accidentally run into this women by accident 57 hours earlier (in story time) at the beginning of the film. This is one of Wong Kar Wai’s recurring themes: that of missed opportunities and connections. In many stories and films there is a fascination with the chance, lucky encounter, because we observe only the real encounters in our experience, not the missed ones. But in our imagination we ponder all the missed encounters and connections that might have taken place but did not. This is where Wong Kar Wai stories live – not in the physical world of action, but in the dreams and imaginations of his characters. Thanks to 223’s self-absorbed persistence and the blonde woman’s weariness, the second chance encounter does make a connection, and they do go home together. But this is hardly a perfect match and nothing romantic ensues (although a final message left at his answering service makes us wonder). Both of these characters have their own particular problems and are lost in their own internal dreamworlds. The blonde woman passes out on the bed, and Cop 223 heads back to the fast-food “Midnight Express” counter, barely noticing a new employee there, Faye (who offers another one of those chance encounters and missed opportunities) who will figure prominently in the second story of the film. Once Faye appears, the camera follows her narrative thread, and the second story begins. Faye, played by Cantonese pop singer Faye Wong, loves pop music, particularly “California Dreaming” by the Mommas and the Poppas. She becomes secretly attracted to another customer of the counter, not Cop 223, but the uniformed Cop 663, played by Tony Leung Chiu Wai, who had already appeared in the inscrutable coda of Days of Living Wild and who would become a Wong Kar Wai regular. Faye quietly eyes Cop 663 as he stops by the food counter every evening to pick up food for his airline stewardess girlfriend. But soon 663 is dumped by the girlfriend, just like Cop 223 had been. We then follow Cop 663 as he falls into his own externalizing of his romantic grieving, in this case talking by himself to various objects in his apartment that had somehow been associated with the departed girlfriend. Again, there is focus on loss and inconsolable loneliness. Just as with Cop 223, 663's life (and the screen we are watching) is now “filled” with absence and emptiness. When a “good-bye” letter from 663's ex-girlfriend is later dropped off at the food counter, Faye discovers a key to his apartment inside. She pockets the key and begins taking afternoon sojourns while 663 is away on duty to this apartment, where she dreamily imagines what life would be like in that apartment with her secret love. But she needs to put her own feminine stamp on these living quarters and erase that of his former girlfriend. Soon she is piece-by-piece redesigning the whole apartment. Despite the obvious alterations, the grieving 663 is completely oblivious and goes on talking to new objects, such as a big Garfield doll that Faye has substituted for the ex-girlfriend’s teddy bear, as if they were simply altered forms of the old familiar objects. For him the objects, themselves, don’t matter; they are simply sounding boards for his interior monologues. Though ridiculous, these whimsical scenes have their peculiar charm and lighten the mood of the sometimes dolorous film. There is one moment in the apartment that brings Faye to tears. While cleaning 663's bed one day during one of her secret visits, she discovers under his pillow a long hair from the ex-girlfriend. For the short-haired Faye this reminder of the “absent” presence in 663's emotional life is too much for her. For the most part Faye avoids expressing herself in words – in fact, she likes to fill her surroundings with loud rock music so that words are driven from her mind. But she does express herself by other gestures. By the end of the film, she has become an airline stewardess, herself, and is growing out her hair. A year later there is one final chance for an encounter between 663 and Faye, and this time, unusual for Wong Kar Wai, there is finally a real connection. The film ends on a note of promise, not of despair. Wong Kar Wai’s cinematic style has increasingly fascinated cineastes, gathered industry awards, and attracted a loyal following, but it has also just as increasingly alienated casual filmgoers and has had diminishing success at the box office. Not surprisingly, there are several different critical takes (which are not mutually exclusive) on what Wong Kar Wai’s style amounts to. Some critics see Wong Kar Wai as an Asian version of French “New-Wave” director Jean-Luc Godard, whose casual cinematic pastiches of the 1960s displayed an off-the-cuff attitude that also attracted a cult following. Still other critics, influenced by postmodernist thinkers, see Wong Kar Wai as the natural evolutionary result of postmodernist developments. Others feel that Wong’s work reflected the political anxieties at that time in connection with the Hong Kong handover to the Chinese government. And, of course, many critics complain that his films have no plot whatsoever, just aimless mood-pieces that have been strung together without any plan. 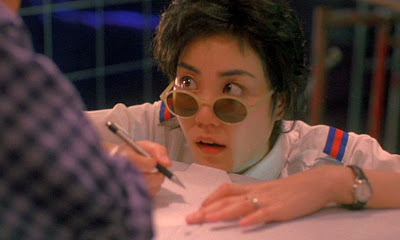 Indeed, although Wong’s background was in screenplay writing, Chungking Express was a further step in the direction of extemporaneous filmmaking. But none of these perspectives really capture the essence of Wong Kar Wai. Though Godard and Wong are both frustrated romantics, their styles are quite different. Godard began creating films in the 1960s that were seat-of-the-pants cinematic essays on contemporary society. They were like visual magazine articles, filled with sly innuendo and cultural wisecracks. But these works had an emotional distance to them, too. They were visualized forms of text. Wong Kar Wai, on the other hand, has a much more consistent, expressionistic style. It is lushly romantic and captures the tensions and moods of nocturnal life in the big city, filled as it often is with existential loneliness. Superbly employing Chris Doyle’s adroit cinematography, Wong Kar Wai captures an essential aspect of big-city life: despite the crowded conditions and numerous encounters with people on the street, there are few opportunities for truly authentic, meaningful encounters. The presence of the crowds offer a constant reminder of the feelings of being cut-off from true human interaction. Wong Kar Wai captures this feeling perfectly in expressionistic fashion by visually exaggerating the crowded conditions and the feeling of close quarters – an effect that would become even more emphatic in his next film, Fallen Angels (1995). In addition, he visually explores the nature of human temporality, itself. 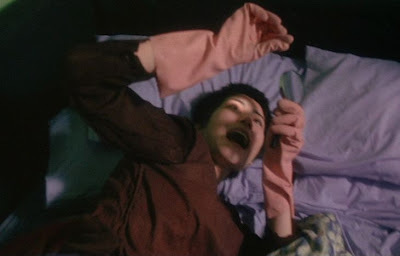 With various stop-action sequences and smudge pixilations, including superposed multiple-speed action sequences, Wong Kar Wai hints at deeper and more direct temporal experiences than does Godard. As for both postmodernist cultural and political influences on Wong Kar Wai, I feel these are indirect, at best. Wong’s Exist entialist style is simply a response to and a reflection on the modern urban life that is becoming almost universal, and this is not directly traceable to specific political and intellectual issues. His films, in fact, will endure longer than the postmodernist cultural critiques that have been applied to them. Perhaps the most significant point to make concerns Wong Kar Wai’s unusual narrative structure, or lack thereof. In fact Wong’s films do have a narrative progression and are not simply aimless meanderings. They are internal journeys of the imagination and not so much identified by landmarks in the physical world. This is what makes his films fascinating cinematic experiences and takes them to a level closer to music than to text (which connects with the fact that theme music is essential to Wong’s films). 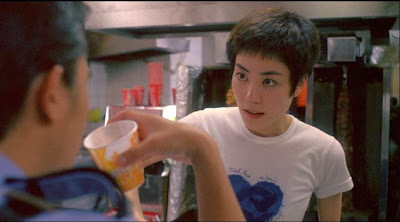 It’s interesting to compare the men versus the women in Chungking Express. There are four focalizations in the film: the woman in the blond wig, Cop 223, Faye, and Cop 663. We peer inside the thinking and feeling of the men, thanks to the interior monologues, but not similarly into the insides of the women. The women are only viewed from the outside and remain opaque and fascinatingly unpredictable. 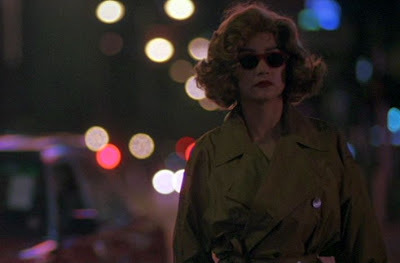 Apparently for Wong Kar Wai, women are eternally mysterious characters: enchanting, but perhaps ultimately unknowable. The only option for men, it seems is to surrender (as Cop 663 does at the end) to their unfathomable allure. The men, 223 and 663, on the other hand, are shown revealing their internal suffering and vulnerability. They are comprehensible, while the women are not. When 663 meets up with his ex-girlfriend again near the end of the film, he stoically presents a friendly, sympathetic smile. The girlfriend, though, seems cruelly unfeeling and invisible behind her disinterested smile. The difference in how we see the two is striking. Note that the two men are so obsessive about their own romantic misfortunes that they are strikingly unobservant of things happening around them. This is ironic, since the two oblivious and self-absorbed cops are supposed to be “watchers" and constantly on the lookout for threats to human safety. The two principal women, by contrast, are acutely observant of the smallest details around them. Faye, for example, notices a single feminine hair on the pillow, while 663 notices almost nothing. And we, the viewers, are observant watchers, too – of both the mysterious charm of the women and the existential loneliness of the men. great post, but the his cut of ashes of time is even more alien to mainstream filmmaking and closer to the wkw personal style you describe than chungking.